Was here on a Sunday night from 10 til close. It was very loud everywhere in the pub and seemed to mainly cater for the African/Caribbean customers with the music selection. Although me and my friends had a decent drinka dn good time on our table, it was quite a dive overall with a range of drunk weirdos and old slappers on the pull. If you are in London and want a more wild drink with a dance come here - however it is sticky, tacky and quite the standard Yates experience. If you want to have a nice drink in London, then avoid at all costs unless it is the day time. Any regular to this site can smell a Roland a mile off. A plethora of one hit comments ! do us a favour. Had a beer and a burger after work last night, was not overly crowded, the food was good for the price there are a lot of staff not from england which sometimes had an impact on ordering, but they were nice enough with it. Will prob go again next time i am in the area! 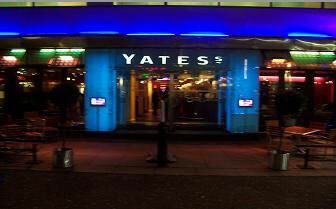 Hey, Last night for the first time went to Yates in Leicester sq, and to be quite honest I really enjoy myself like I haven't for a long time, a nice envoirement, not to cheap not to expensive! Appart the fact that was bit crowded, the service was great, the staff was super friendly not compared to some other pubs in the area with a very smily NOT faces and not really sympathetic. Summarising I really I a good time. Appart from the nasty comments surronding this place, I think people shouldn't make a pre-concepted ideas or stade of mind, which or not really pleasant, they should check it by themselfs, I like my oppinion Its an A+. 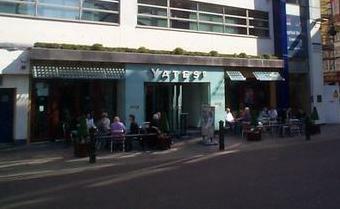 P.s: I am not a employee from yates, just costumer, and I know how to write in perfect English!!! PAT - clearly you dont have a life!!!!!! so what you have had a bad experience there, get over it!!! you have nothing better to do than slate this place, why not let people go and experience it themselves..........judging by your one review and your constant irrelvant comments you dont get out much! this is not face book this is a place for people to put a review down, i will not reply after this, as i have ALREADY written my review, just thought someone should let you know, that you should do the same!!! !